It’s almost Thanksgiving which means the hot stove should be well underway. Unfortunately it’s not. As usual the Dodgers have done very little to nothing in terms of adding players for next year’s roster. The Dodgers still need a new GM, hitting coach, third base coach, starting catcher, and starting second baseman. Finding a new GM should be one of the most important tasks, but Andrew Friedman stated that he’s in no rush and just hasn’t wrapped his arms around it yet, despite former GM Farhan Zaidi leaving for the Rival Giants which leaves the Dodger’s general manager chair empty. Once again Friedman will wait until the very last minute to do anything and you can bet that all of the good free agents will be signed by then. That means Friedman is running the show on his own. Meaning he’ll run things without a GM for now. This also likely means that Austin Barnes will be the starting catcher in 2019, despite him being an automatic out. Maybe he regains his stroke next year, but it’s very possible he bats .130 and has one of the most punchless seasons in Dodger history. But let’s take a look at a huge positive for the Dodgers in 2019 and that’s their strong pitching staff. What will the Dodger pitching staff look like for 2019? Well you have a very strong rotation with everyone under contract for 19. Clatyton Kershaw, Walker Buehler, Rich Hill, Julio Urias, and Hyun-jin Ryu will all be coming back. The Dodgers also still have Kenta Maeda, Alex Wood, Ross Stripling and Brock Stewart under contract and ready to contribute. My guess is the Dodger pitching staff will look like this for next season. There’s not much room for additions to be honest. Those guys above are all locks to make the roster, or at least most of them. Unless one or more are traded, I see all of them making the opening day squad. There’s 11 pitchers listed above and most teams carry a 12-man pitching staff. The Dodgers might only have one or two spots available for offseason additions. I stated previously that I like Adam Ottavino as an eighth inning middle relief guy. Please don’t give me the whole “teams don’t spend money on relievers crap” because Ottavino made 7.5 million dollars in 2018 and would come pretty cheap. Maybe the Dodgers offer him a 10-15 million dollar per year contract. That’s still pretty inexpensive in comparison to most contracts these days. There’s no way that Ottavino would put the Dodgers over the luxury tax. There are some question marks. Can Kershaw regain the velocity he lost in 2018? Can Buehler continue his rising stardom? Can Urias recover and become a solid contributor? Is Maeda a reliever or starter? Can Ross Stripling make it through an entire season without getting injured? Can Hill make it through an entire season without injury? Can Baez recapture some of his late season magic? Can Kenley recover from his heart problem? Can Ryu stay healthy? Who will come up from the minors to help when the regulars eventually do get hurt? There are so many questions, but a lot of options. The Dodgers are going to have a super talented and deep pitching staff in 2019. I’m confident that even with the bullpen problems, the restructuring, resurgence of Pedro Baez, discovery of Caleb Ferguson, contributions of Maeda, Wood and Stripling, and a healthy Kenley Jansen will give the Dodgers a reliable bullpen. I’m not worried much about the Dodger’s pitching staff next year. Now the offense side is another story. Well, it looks like the Dodgers will sit on their hands and not make a dumb, drastic move for a starting catcher to replace the “switch-swinging” and defenseless Grandal. Austin Barnes will no doubt end up being the starting catcher by default. IMO, Barnes will be OK, as long as he gets the reps. So much of offensive consistancy comes from playing every day. 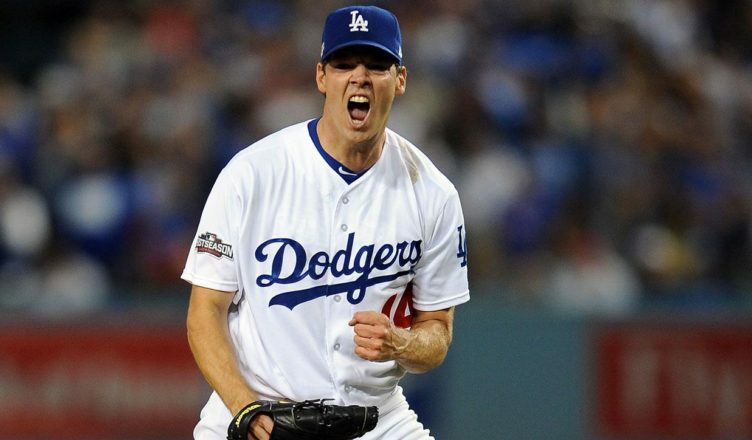 As long as the Dodgers do not overplay the platoon scenario, Barnes should fair well. Most of the Dodger lapses in production came from players being switched in-and- out too often. If you do not get enough playing time, you lose effectiveness, offensively and defensively. Timing, reflex, and repetition are essential for a player’s success. As far as pitching, it is the same old song as last year. Boasting a truckload of starters, “hoping” and “praying” they will live up to their potential, recover from injuries, and avoiding reoccurrence of injuries. Also relying on Kershaw to reinvent himself, and for Jansen to recover from his heart problems. Scott’s piece is pretty accurate. The team doesn’t need much starting help. They don’t need much OF help (although I’m still pining for Harper, but not sure how to fit him in.) The IF is pretty set and a platoon at 2B should be easy to implement. Catcher is the big question, and then how badly does the team want to get into a bidding war for a top tier player. I know with all the sabermetrics and geek crap you have died and gone to heaven but don’t you ever get tired of the Friedman lies and BS? You buy it and then don’t understand why we hate the FO. You just try and understand the crap you are being fed. Good for you but don’t expect us to buy it. Friedman is an idoit and he makes some of us look like idiots if you believe him. Screw him, use common sense and you will see how stupid he is. The front office got this team to the World Series in back to back years. They have spent the most money. They are four wins away from back to back titles. The fans love the team. The attendance is through the roof. Other teams are jealous of the team and are constantly signing executives and coaches. Brutus, we are all relieved to know that Scott has your stamp of approval on his piece. Dude, are you really that big of a narcissist or are you putting us all on? Please return to Moe and Lesters site and remain there, you fit it great with that FN narcissist. Can anyone please translate that final sentence for me? Ottavio? He hasn’t even had his first TJ surgery yet! Quakenbush–the dance begins. I’m expecting another season of revolving-door acquisitions off the waiver-wire and the 60-day DL, hoping to find another Brandon Morrow. It does not matter how much. money they spend, or how many overpaid, over rated players, coaches and top executives they go through, or how many WS’ they get to, If they cannot grab the Golden Ring, they have FAILED themselves and most importantly their loyal Fans. I am tired of hearing fans say they truely enjoyed witnessing the back-to-back failures, they are lying to themselves. This is Baseball, not Horseshoes. “Close” gets you nothing but misery. Bluefan, I agree, they have accomplished a lot getting to six straight division titles, but I am seeing flashbacks of the Braves who dominated the NL for 14 seasons and won 1 title. We all know how Friedman thinks and operates because it is the same old LA two step every year. And Bluto, in 2018 they did not spend the most money. They have spent a lot of money that’s for sure. But they do not hand out multiyear long term contracts. The only players who have signed for more than 4 years are Jansen and Turner, and neither one of those guys got a 9 figure deal. Turner got 64 million for 4 years and Jansen 80 for 5. Maeda is on an 8 year deal, but it is very team friendly. And his contract is loaded with incentives. A lot of that comes from the fact that they suspected that somewhere along the way he would have elbow trouble. This week they have to decide on who to protect from the Rule 5 draft. From the list I saw, the only real lock is Ruiz. Plus they will start non tendering players and some who were here last year will be out looking for a job. The meetings next month will be very interesting. But I agree it will probably be business as usual for Andy boy. Fringe moves, waiver wire pickups, minor trades, but I seriously doubt they go whole hog on any major free agent or a big ticket trade. Forget Harper. It’s ok that Bluto believes in Friedman, he is one of the few who can enjoy watching boring baseball. You do have to get there to win, but the object after you get there is to win. Anything less is a disappointment. Especially when your team folds like a wet taco at the worst possible moment. I remember the Braves streak back in the day and I remember who was running things. That is correct. Our very own Stan Kasten. The fans down here hated him for never bringing in enough talent to win. Yes sir, and Bluto was right, for a while they spent the most money. But how much of those millions were just wasted? 64 Million for Olivera, over 30 million for 3 years on McCarthy, 10 mil on a lost season from Anderson. Yeah, they traded some guys and got some value back, and last year they made the salary dump trade with the Braves to get under the tax, but you can go down the line and see a lot more failures than success. Plus, the signees from Cuba have been a huge bust. Sierra is eligible for the Rule 5 draft. Guy has never gotten past AA and he got 16 million. Adrian Beltre retired. One of the stupidest moves the Ownership ever made was not re-signing the guy. He is going to be in the hall.